We also provide a dedicated family matching service for Nanny share, which spreads the nanny cost between two families. We can also provide part time and ad-hoc services to suit you. Join us now! We are one of the few agencies to be currently VAT free. It is FREE to register for either Families or Nannies and it’s also free for the families to see the CVs so why don’t you see if we can find someone to suit you and your budget. You might be pleasantly surprised! We charge £20 in advance to organize interviews, per candidate (in person, over the phone or via Skype) but this fee is deducted from the introductory fee in case you hire one of our candidates. We understand how difficult it can be to find the right childcare for you and your family. So, as discerning agency we really care that you get the most suitable person for your needs. Let our friendly team do the legwork and take the worry out of one of the most important decisions you will ever make. Our interview arrangements are £20 per candidate per interview but this fee is subtracted from the placement fee if you choose one of our candidates. A Nanny could be a comparable and vastly preferable option. Key advantages are that they work at your home, serving your chosen food, attending your local groups. They can take over very early, dress your children in the mornings, give them breakfast, they can do children’s laundry, ironing and bath your children end of the day for when you get home you have some fun time with them, not to mention your children will be looked after in their own safe home. There are no rigid hours, waiting lists and parking problems. A nanny is the ideal childcare solution. We are flexible and can tailor our services to fit your needs, irregular hours, shift work, etc. We place Nannies in a huge range of families around the world. Please browse our website and don’t hesitate to contact us if you have any questions. We are here to help! Did you know that research shows that families spend an average of 60 hours looking for a nanny without an agency? With our help you can cut that time in half without compromising on the quality of childcare for your child. We also offer Childcare Courses and Enhanced DBS check for nannies and families as well as advice on employment contracts, nanny payroll and compliance with HMRC contributions. Our main office is based in the Royal Borough of Richmond and Twickenham on the border of London and Surrey and we cover: Richmond, Twickenham, Teddington, Hampton, Kew, Strawberry Hill, St. Margaret’s, Barnes, Chiswick, Wimbledon, Fulham, Putney, Kingston, Hammersmith, Shepherd’s Bush, Kensington, Victoria, Knightsbridge, Gloucester Road, Chelsea, Notting Hill, Paddington, Maida Vale, Hampstead, Camden, King’s Cross, Archway, Angel, Old Street, Clapham, Sloane Square, Mayfair, Belgravia, Marylebone, Holland Park, Regents Park, Islington, Finchley, London Bridge and more. Surrey: Epsom, Cobham, Ewell, Esher, Weybridge, Whalton, Sunbury, Byfleet, Chertsey, Richmond, Hampton, Molesey, Kingston and more. If we do not answer the phone, please leave a message or e-mail us on info@brilliantnannies.co.uk, we will get back to you ASAP. "Thank you! Brilliant Nannies has been an excellent way for me to find top quality temporary nannies!" B. Dickinson, Richmond. 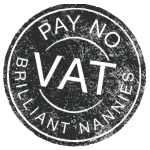 "Brilliant Nannies is a friendly, efficient and professional agency. Great advice and help with my CV. Thank you" L. Moss, Chessington.